"SmartSail" Technology: Introducing the first adaptable sail structure. underlying structural principles from load path jib. Complex fiber layout produces interlocked structural system addressing loads in all directions throughout the sail. • Mid sail detail of load path versus smart structure genoa. 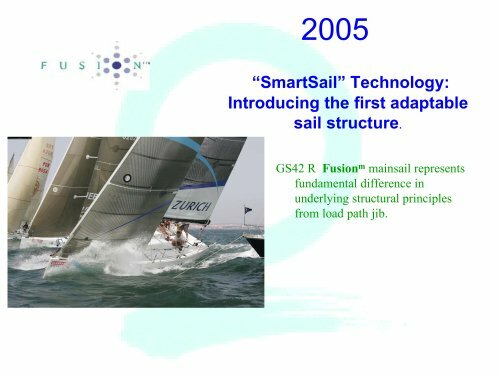 • Fusionm is the first "smart," adaptable sail structure. • As the sail is loaded, the structure moves evenly, and does not allow one part to load up more than another. By avoiding uneven loading, the sail remains easy to trim through a wider range, and does not become distorted, making for better shape life over the long haul. • Fusion is the first sail to utilize an Isostrain, as opposed to a Load Path structure.